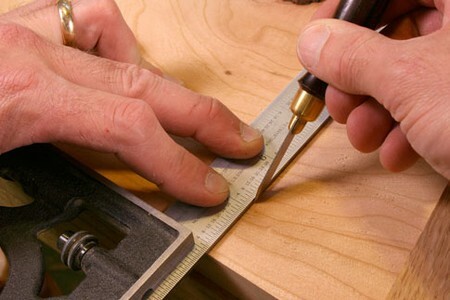 The positions for cuts, holes and so on in wood are usually marked with a pencil, with a knife or with a pin attached to a gauge. All these marks must be drawn clearly but lightly as they may have to be removed when the job is finished. A marking knife can mark closer to the rule or straight-edge than a pencil and actually cuts the surface fibers of the timber. 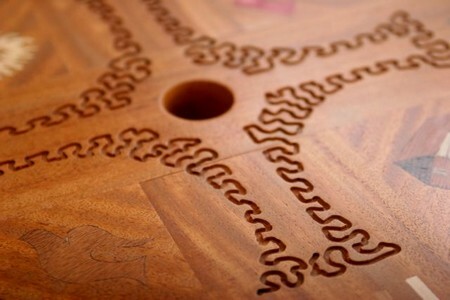 Cutting the surface fibers helps to prevent chipping when the wood is subsequently cut with a saw – it is essen­tial when cutting veneered chipboard to prevent the surface veneer flaking along the cut. A special woodworking marking knife generally has a forged carbon steel blade with a riveted hardwood handle. The blade, which is angled to make it easy to use, should be kept razor sharp. A trimming knife can be used as an alternative. The simplest way to divide distances is by straightforward use of a rule or dividers – the latter should be set to the required measurement against a rule and then walked across the material using a swiveling motion. Each point will mark off the required distance. But occasion­ally you will be faced with pieces of wood which are an awkward size to divide simply – for example, you might want to divide a 67mm width into four equal parts. To do this, hold a rule across the board at an angle so that the zero end of the rule coincides with one side of the board and the l00mm end, say, coincides with the other side. Mark off where the 25, 50 and 75mm graduations occur to give four equal parts.